After the flop — but personal guilty pleasure of mine — of X-Men Origins: Wolverine. Marvel waited on the franchise and focused elsewhere (Hello Avengers). But this film, while having a couple problems for me as a huge fan of Wolverine and the X-Men, still remains a fun and enjoyable adaptation of one of the characters most central storyline. After the killing Jean Grey at the end of X3, Wolverine, aka Logan (I wonder how many people didn’t know that tidbit), has retreated into the mountains in an attempt to remain apart from humanity. He has realized the one true problem of his immortality; since he can never die he will always outlive everyone he ever loves or cares about. However, fate conspires against him when an assassin/bounty hunter, hired by the Japanese soldier Logan saved at Nagasaki, brings him to see the man on his deathbed. Logan is offered an end to his immortality by Yashida — who would soon after die by mysterious causes. During Yashida’s funeral, a Yakuza gang attempt to kidnap Yashida’s daughter Mariko which pulls Logan back into the world of civilization and forces him to be the hero against forces hell-bent on attempting to steal his powers and murder the last of Yashida’s line. The main problems I personally had with this movie comes from me being a fan of the characters and the X-Men universe. A character that was hyped in the trailers was the Silver Samurai — a character known for having mutant abilities that make him a deadly threat to Wolverine. Problem is he appears only in the last 20 minutes of the movie and really should’ve been called the Silver Terminator in this. The other problem is a continuity hiccup. Wolverine had previously lost his memory around the time of 3 Mile Island in 1979, and yet he perfectly remembers saving the life of a Japanese officer during the Nagasaki Bombing in 1945. How the hell does that work? What makes this movie work is its two leads. You can see as the movie progresses how Wolverine comes to grips with his unnatural existence. You can see that ‘yes he will always outlive his loved ones’, but that doesn’t mean he can’t cherish those times. Also seen after his epiphany is his determination to fight for his new friends even to the point of becoming an arrow porcupine trying to reach Mariko. Mariko on the other hand grows as a character in that she stops acting in the way that is expected of her and fights for what she wants instead of meekly following her step- father’s wishes. At one point she even stabs a former boyfriend in the leg because he starts working for the enemy. The action in this movie is also quite fun mixing high speed (bullet train) fights with old fashioned samurai and ninja duels all while using the unique healing of Wolverine to the fullest. In the end this was a good movie that suffered somewhat from me being too big a fan and knowing more than average about Wolverine and his history. 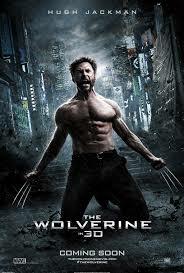 This movie has good action, more than expected funny lines and a lot of Hugh Jackman shirtless. (The girl I was with loved that). I give this movie an 8/10. It may not have been perfect but I had plenty of fun.